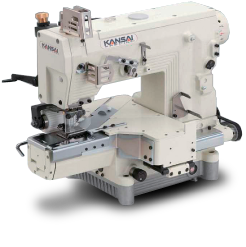 DX series is cylinder bed (circumference 340mm), from 2 to 5 needle double chain stitch machine with horizontal looper movement mechanism. It can be used for attaching endless or pre-closed elastic. Major feature of this series is the cylinder bed. This feature gives you benefits when you work with exercise wear, pajamas, trunks, boxers and similar garments.